Every UK gallon has 4.546 litres, but a US gallon only has 3.785 litres. 1psi water pressure is generated by approx. 2′ in height (feet head). Therefore a water tank 30′ above the ground, generates 15psi, and 15psi is approx. 1 bar in water pressure. 1 degree Clark (water hardness measurement) is approx. 14.3ppm (parts per million); and ppm and mg/l (milligrams per litre) are the same measurement. In every litre there is 1,000 millilitres (ml), which is the same as 0.22 UK gallons, which is actually 1.76 pints. In every cubic metre of water there is 1,000 litres, and 1,000 litres is equal to 220 gallons. 15mm copper tube has a cross-sectional area of 176mm². 22mm copper tube has a cross-sectional area of 380mm², which is 2.16 times greater than a 15mm! 28mm copper tube has a cross-sectional area of 615mm², which is 1.62 times greater than a 22mm! 35mm copper tube has a cross-sectional area of 962mm², which is 1.56 times greater than a 28mm! 42mm copper tube has a cross-sectional area of 1385mm², which is 1.44 times greater than a 35mm! 54mm copper tube has a cross-sectional area of 2290mm², which is 1.65 times greater than a 42mm, and an incredible 13 times more than where we started at 15mm! Where a male thread is stated it refers to male BSP in all instances. 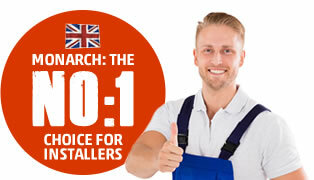 Where speedfit is stated it can also be known as ‘push fit’. All information, figures and specification are correct at time of printing and given in good faith. Omissions & Errors excepted. As part of ongoing research and development, we reserve the right to alter design or specification without prior notice. All guarantees are given in accordance with Monarch Waters National Service Coverage Area Agreement. Full details are available by calling Monarch directly for a printed version. All water softeners need operating pressures between 1.5 bars (dynamic) and 5 bars (static). All Scaleout units need operating pressures between 1.5 bars (dynamic) and 5 bars (static). All items to be protected from freezing. All cold water softeners must be limited to water temperature not exceeding 50ºC. 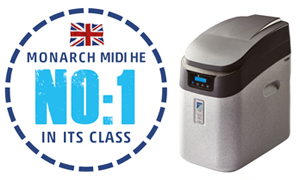 All hot water softeners must be limited to water temperature not exceeding 65/70ºC, depending on model specification. All Scaleouts are to be limited to water temperature not exceeding 50ºC. Water softener capacities are based on a water hardness of 300ppm. Empress CFU capacities are based on a water hardness of 180ppm. All dimensions are shown in millimetres.